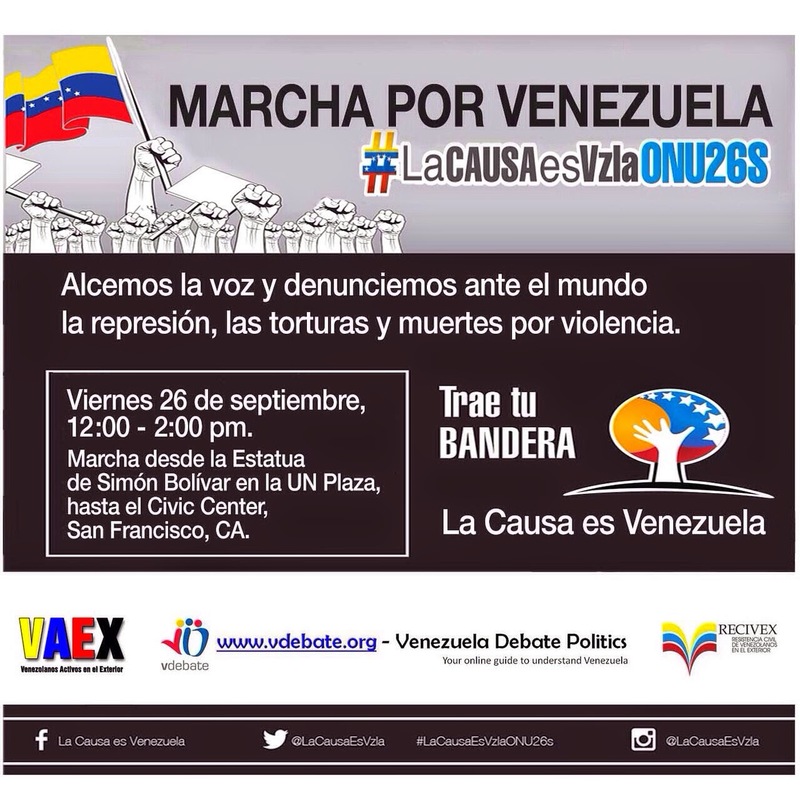 Venezuelans in New York and San Francisco will be raising their voices to the world to denounce the repression, torture, human rights violations, and deaths for violence in Venezuela. 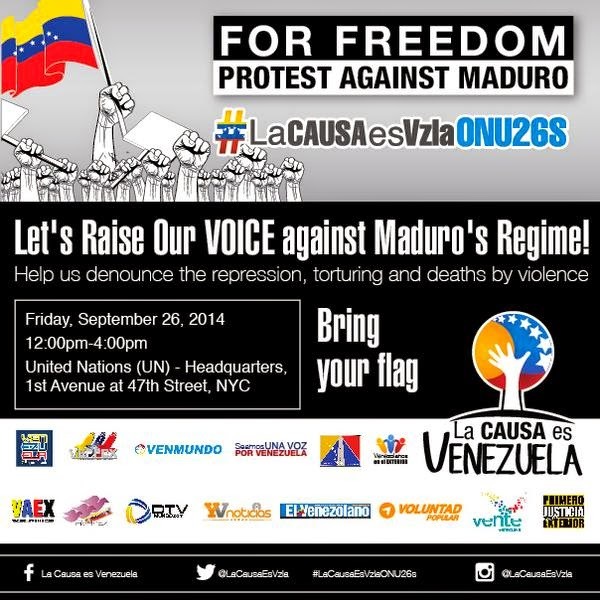 Venezolanos en New York y San Francisco estaran alzando sus voces para denunciar ante el mundo la represión, las torturas, la violación de los derechos humanos, y las muertes por violencia en Venezuela. Location: In front of the United Nations (47th Street & 1st Avenue). Lugar: Sede de la ONU, Calle 47 con Primera Avenida - New York. Location: March from the Simón Bolívar Statue in the UN Plaza to San Francisco Civil Center. Venezolanos en San Francisco protestarán al presidente de Venezuela, Nicolás Maduro, marchando:. 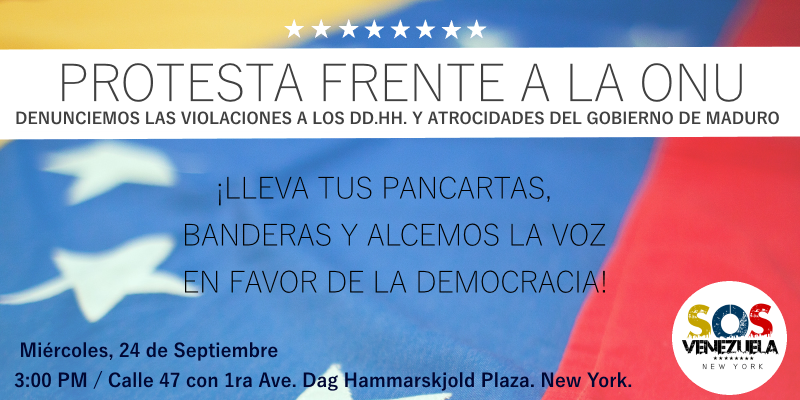 This Wednesday at 3PM is scheduled a protest at Dag Hammarskjold Plaza located in front of the United Nations (47th Street & 1st Avenue) to repudiate the words of Nicolas Maduro, who is scheduled to address theUN tomorrow. There will be Venezuelans denouncing Human Rights violations, illegal arrests, the existence of political prisoners, severe economic and health crisis accompanied by the greatest shortages in modern times in our country and the unbridled violence. Also reject Venezuela's bid to the Security Council of the UN. CAMBRIDGE – Will Venezuela default on its foreign bonds? Markets fear that it might. That is why Venezuelan bonds pay over 11 percentage points more than US Treasuries, which is 12 times more than Mexico, four times more than Nigeria, and double what Bolivia pays. Last May, when Venezuela made a $5 billion private placement of ten-year bonds with a 6% coupon, it effectively had to give a 40% discount, leaving it with barely $3 billion. The extra $2 billion that it will have to pay in ten years is the compensation that investors demand for the likelihood of default, in excess of the already hefty coupon. Venezuela’s government needs to pay $5.2 billion in the first days of October. Will it? Does it have the cash on hand? Will it raise the money by hurriedly selling CITGO, now wholly owned by Venezuela’s state oil company, PDVSA? A different question is whether Venezuela should pay. Granted, what governments should do and what they will do are not always independent questions, because people often do what they should. But “should” questions involve some kind of moral judgment that is not central to “will” questions, which makes them more complex. One point of view holds that if you can make good on your commitments, then that is what you should do. That is what most parents teach their children. But the moral calculus becomes a bit more intricate when you cannot make good on all of your commitments and have to decide which to honor and which to avoid. To date, under former President Hugo Chávez and his successor, Nicolás Maduro, Venezuela has opted to service its foreign bonds, many of which are held by well-connected wealthy Venezuelans. Yordano, a popular Venezuelan singer, probably would have a different set of priorities. He was diagnosed with cancer earlier this year and had to launch a social-media campaign to locate the drugs that his treatment required. Severe shortages of life-saving drugs in Venezuela are the result of the government’s default on a $3.5 billion bill for pharmaceutical imports. A similar situation prevails throughout the rest of the economy. Payment arrears on food imports amount to $2.4 billion, leading to a substantial shortage of staple goods. In the automobile sector, the default exceeds $3 billion, leading to a collapse in transport services as a result of a lack of spare parts. Airline companies are owed $3.7 billion, causing many to suspend activities and overall service to fall by half. In Venezuela, importers must wait six months after goods have cleared customs to buy previously authorized dollars. But the government has opted to default on these obligations, too, leaving importers with a lot of useless local currency. For a while, credit from foreign suppliers and headquarters made up for the lack of access to foreign currency; but, given mounting arrears and massive devaluations, credit has dried up. The list of defaults goes on and on. Venezuela has defaulted on PDVSA’s suppliers, contractors, and joint-venture partners, causing oil exports to fall by 45% relative to 1997 and production to amount to about half what the 2005 plan had projected for 2012. In addition, Venezuela’s central bank has defaulted on its obligation to maintain price stability by nearly quadrupling the money supply in 24 months, which has resulted in a 90% decline in the bolivar’s value on the black market and the world’s highest inflation rate. To add insult to injury, since May the central bank has defaulted on its obligation to publish inflation and other statistics. Venezuela functions with four exchange rates, with the difference between the strongest and the weakest being a factor of 13. Unsurprisingly, currency arbitrage has propelled Venezuela to the top ranks of global corruption indicators. All of this chaos is the consequence of a massive fiscal deficit that is being financed by out-of-control money creation, financial repression, and mounting defaults – despite a budget windfall from $100-a-barrel oil. Instead of fixing the problem, Maduro’s government has decided to complement ineffective exchange and price controls with measures like closing borders to stop smuggling and fingerprinting shoppers to prevent “hoarding.” This constitutes a default on Venezuelans’ most basic freedoms, which Bolivia, Ecuador, and Nicaragua – three ideologically kindred countries that have a single exchange rate and single-digit inflation – have managed to preserve. So, should Venezuela default on its foreign bonds? If the authorities adopted common-sense policies and sought support from the International Monetary Fund and other multilateral lenders, as most troubled countries tend to do, they would rightly be told to default on the country’s debts. That way, the burden of adjustment would be shared with other creditors, as has occurred in Greece, and the economy would gain time to recover, particularly as investments in the world’s largest oil reserves began to bear fruit. Bondholders would be wise to exchange their current bonds for longer-dated instruments that would benefit from the upturn. None of this will happen under Maduro’s government, which lacks the capacity, political capital, and will to move in this direction. But the fact that his administration has chosen to default on 30 million Venezuelans, rather than on Wall Street, is not a sign of its moral rectitude. It is a signal of its moral bankruptcy. Is Venezuela on the Verge of Default? Venezuelan President Nicolas Maduro instructed the attorney general and public prosecutor to take “actions” against Harvard Professor Ricardo Hausmann, saying the economist sought to destabilize the country by suggesting the government default on its debt. Maduro lashed out at Hausmann during a televised address last night, calling him a “financial hitman” and “outlaw” who forms part of a campaign “that has been initiated around the world against Venezuela.” He didn’t specify what actions he had asked the attorney general and prosecutor to take. Venezuelan bonds tumbled earlier this week after Hausmann co-wrote an opinion piece on Sept. 5 with a Harvard colleague arguing the country should consider defaulting because it had already racked up billions of dollars of arrears with importers. Widespread shortages of everything from toilet paper to medicine have helped fuel the world’s fastest inflation. The president’s office, the attorney general and the information ministry didn’t immediately reply to e-mails seeking comment on what actions were planned against Hausmann. Born in Venezuela, the professor served as planning minister in the 1990s under the president that Maduro’s mentor and predecessor, the late Hugo Chavez, tried to topple in a coup attempt. He has lived in the U.S. since 1994. Maduro and Chavez have jailed opponents in the past. National Guard troops arrested opposition leader Leopoldo Lopez in February following protests that left five people dead, accusing him of inciting violence. Former Defense Minister Raul Baduel, who served as a paratrooper with Chavez before being jailed after breaking with the government, is among a group of political opponents serving an eight-year sentence. In the interview today, Hausmann reiterated his comments from the Project Syndiate opinion piece that Venezuela has already defaulted on importers and suppliers while noting that the country’s constitution guarantees freedom of speech. “The question is not will Venezuela default or not,” he said today. “Venezuela already has defaulted. The question is who gets paid. Venezuela is only paying Wall Street." The country’s benchmark bonds due 2027 sank 3.6 cents to 70.08 on the dollar on Sept. 8, driving their yield up to a six-month high of 14.4 percent, as Hausmann’s comments added to investor concern about a nation that saw its foreign reserves sink to an 11-year low last month. While the bonds are rebounding, they remain the most expensive sovereign debt to insure against default in the world, according to data compiled by Bloomberg. Investors pay 14.33 percent annually for protection against non-payment over five years, a rate that implies a greater than 60 percent chance of default during that period. In his speech last night, Maduro made reference to Hausmann’s role in the government of then-President Carlos Andres Perez. It was Perez’s fiscal austerity and free-market measures that triggered rioting and street protests and led to the coup attempt in February 1992 that made Chavez a public figure in Venezuela. Hausmann was appointed minister in a reshuffle after the coup. “You’re the top adviser, Ricardo Hausmann, of all these groups that want to inflict economic damage” on Venezuela, Maduro said. “Of course, because you live in your mansions over there” in the U.S., he said. Hausmann denied receiving payment for his comments or having links with investors interested in driving down Venezuelan bonds. Maduro’s threats are “evidence of an outlaw government, a rogue state,” Hausmann said. Hausmann was the first chief economist of the Inter-American Development Bank. While there he and Barry Eichengreen developed the concept of “original sin” to describe how emerging-market borrowers with weak domestic capital markets are forced to borrow in hard currency. The currency depreciation then makes it harder for them to pay debt back should they run into trouble. Eichengreen teaches at the University of California at Berkeley. Hausmann discloses his consultancy work on Harvard’s website. Last year he spoke at conferences organized by Banco Bilbao Vizcaya Argentaria SA, JPMorgan Chase & Co. and UBS AG. As Venezuela racks up billions of dollars of arrears with importers that are fueling the worst shortages on record, one of the nation’s top economists is questioning the government’s decision to keep servicing its foreign bonds. While Hausmann declined to say if he’s specifically recommending a default, he said he found “no moral grounds” for the government and state-owned oil company Petroleos de Venezuela SA to make $5.3 billion of bond payments due in October. With foreign reserves at an 11-year low and arrears to importers growing, Venezuelans are struggling to find everything from basic medicines to toilet paper. And prices are surging on the goods that they can buy, saddling the country with the world’s highest inflation rate. The nation’s bonds are sinking as President Nicolas Maduro fails to stem the crisis, extending declines today. The extra yield investors demand to own Venezuelan sovereign bonds instead of Treasuries jumped 2.99 percentage points in the past month to 13.39 percentage points at 3:12 p.m. in New York, the highest since February, according to data compiled by JPMorgan Chase & Co. The spread is the highest in emerging markets. Bonds slumped last week after Maduro removed Rafael Ramirez, the country’s main economic policy maker, fueling concern the government may delay or scrap measures to ease the hemorrhaging of dollars, including a currency devaluation and increase in gasoline prices. Marcos Torres, the head of economy and finance at the central bank, didn’t reply to an e-mail seeking comment on Hausmann’s statements. An official at the Information Ministry declined to comment when reached over the weekend. Hausmann has been a public figure in Venezuela for more than two decades, having served as planning minister in the government that the late Hugo Chavez, Maduro’s predecessor and mentor, tried to topple in a 1992 coup attempt. Hausmann then joined the Inter-American Development Bank, where he was chief economist, before leaving for Harvard in 2000. In a Sept. 5 piece published in Project Syndicate that was titled “Should Venezuela Default?”, Hausmann and Miguel Angel Santos, a Harvard research fellow, highlighted how the import arrears and shortages are imposing hardship on Venezuelans. Francisco Rodriguez, an economist at Bank of America Corp., said that defaulting now would be a mistake. Distortions created by the government’s price and foreign-exchange controls, rather than a lack of hard-currency, are causing the shortages, he said. The rout in Venezuela’s bonds this year stands in contrast to the returns they generated during Chavez’s tenure. While the currency and price controls, along with state takeovers of companies, caused investor concern, soaring oil prices allowed the government to keep serving its debt. Venezuelan bonds returned 677 percent from his inauguration in 1999 until he died in March 2013, beating the 387 percent average gain for emerging-market debt during that span, according to data from JPMorgan. One of the problems the government could face in defaulting is that bondholders may seek to seize the assets of Citgo Petroleum Corp., the U.S. refining and distribution arm of Petroleos de Venezuela, to recoup their money. Petroleos de Venezuela has said that it’s looking to sell Citgo for at least $10 billion. Even that amount wouldn’t cover arrears to importers that Morgan Stanley estimated in June may be as much as $13 billion, a figure that equals more than half the country’s foreign reserves. Venezuela has delayed regular reporting of economic statistics and has yet to publish inflation data for June, July or August after annual consumer-price increases reached 61 percent in May. That was the highest among all economies tracked by Bloomberg. The increasing difficulty of finding dollars is forcing Venezuelans to the government’s official distribution depots, where they line up for subsidized goods with numbered tickets that give them the right to buy items including frozen chicken, rice and cooking oil. Protests sparked in part by the shortages have led to 43 deaths this year. It’s “a completely unsustainable situation,” Hausmann said in the telephone interview. Venezuela’s foreign-currency debt is the most expensive in the world to insure against default with credit-default swaps after similar securities for Argentina stopped trading when it couldn’t make a payment due July 30. Venezuela’s CDS have surged 3.73 percentage points in the past month to 14.47 percentage points. That implies a 63 percent chance of a disruption in payments in the next five years, according to data compiled by Bloomberg. Venezuela’s $4 billion of notes maturing in 2027 dropped 3.53 cent to 70.13 cents on the dollar at 12 p.m. in New York. When asked what he would do if he were in Maduro’s position, Hausmann’s answer illustrated both his lack of confidence in the government as well as the magnitude of the challenge facing the country. “I would immediately resign and call democratic elections,” he said.